IDF Chief of Staff says use of open fire rules on flyers of terror kites and balloons legally difficult. The ministers of the political-security cabinet met today (Sunday) to discuss the situation in the Gaza Strip. 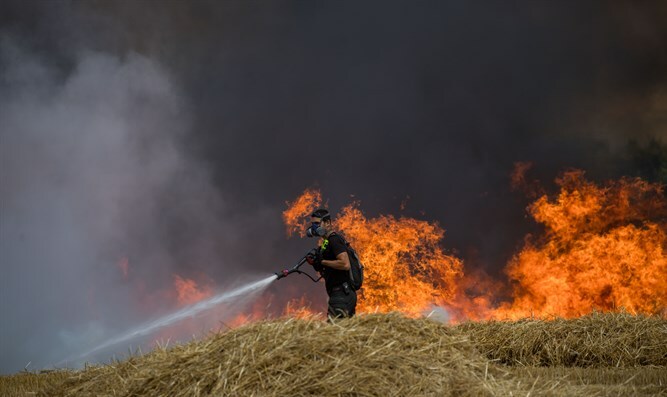 The ministers demanded that IDF Chief of Staff Gadi Eizenkot eliminate the terrorists from the Gaza Strip who launch incendiary kites and balloons at Israeli territory. The chief of staff told the heads of the cabinet that it was Hamas that ran the kite-launching operations in Gaza and explained that there was a legal problem in defining all the kite launches as life-threatening, which would allow the IDF to use live fire against the perpretrators. At the same time, as a result of the growing kite terror from the Gaza Strip, a senior military source told the residents of the area that "the alternative to kite terrorism is war, and if we react too forcefully, we can be dragged into escalation." News 2 reported that the source warned the residents that in the event of a war, "you will be in the armored personnel carriers, which is something you do not want want construction of the barrier against the tunnels is not yet complete. Earlier this evening two balloons carrying Molotov Cocktails were discovered in a town in the Sdot Negev Regional Council. The balloons struck a residential building, and policemen who came to the scene drove curious civilians away. In addition, three Molotov Cocktails prepared by Arabs from the Gaza Strip were located in Sderot. Earlier, The IDF also opened fire on a group of terrorists who were launching a series of incendiary balloons. The IDF also called on the public in the Gaza periphery to keep away from suspicious and dangerous objects.